Mixed materials can describe anything from a contemporary lamp crafted of marble, brass, and canvas to a rustic wood coffee table with slate tiles and scrolling iron legs. On a larger scale, it refers to the way you pull together an individual collection of furnishings with a mixture of finishes and materials that complement rather than match each other. Combining unique materials and mixing colors adds a vibrancy and character to your space, making your home uniquely yours. In the bedroom pictured above, notice the combination of metal and upholstery on the bed. The bedside table crafted of wood and metal is further embellished with a wicker basket for storage. The accompanying armchair in a slightly deeper shade of fabric complements the neutral tones of the bed rather than matching it. The addition of a ceramic vase, a mixed material lamp and a fluffy throw enhance the room with smooth, polished and plush details. Different wood finishes come together in this fresh and inviting cottage-style dining room. With the table top and server in a warm cherry finish, this collection maintains its cohesion with its traditional styling, carved details and coordinated seat upholstery. A woven basket, carved candlesticks and a hand-blown glass vase create a rich tapestry of decor accents. 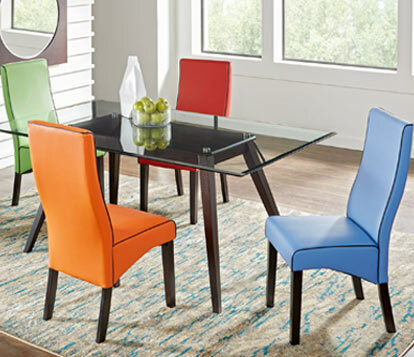 A contemporary dining room gets a fresh look with a vivid assortment of black trimmed chairs. 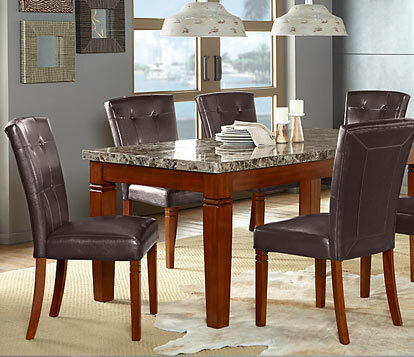 A transitional marble top table is accompanied by handsome set of leather seats. The room gains definition with the assorted metal frames and distressed lighting fixture as well as layered sisal and hide area rugs. Create a living room that feels comfortable, captivating and altogether livable. This upholstered sofa and leather chair are complemented by a wood, glass and metal coffee table, augmented with a concrete accent table and accented by ceramic, metal and marble decor. The room is brought together with navy blue nuances throughout. The silver and gold tones mix harmoniously as individual elements and as partners on the patterned toss pillows. Industrial style furnishings frequently boast multiple materials, including mixed wood finishes and exposed metal elements as well as leather, upholstery and rustic details. But you can embrace this approach to design in any style be it contemporary, rustic, mid-century modern or classic. Read more about mixing styles, colors and patterns in these related articles: How to Mix Things Up – Creating a Custom Living Room and Mixing Colors and Patterns - Why Do These Rooms Work?